Many Dragon Age fans are doubtless very much looking forward to the next instalment of the franchise, but maybe their enthusiasm will be dampened given the latest from the gaming grapevine, which seems to indicate that EA has switched course to model the RPG more along the lines of Anthem. 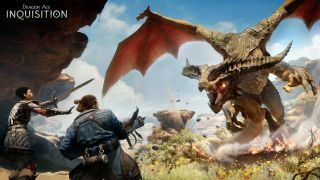 This comes from Kotaku, in an interview concerning Bioware’s slow progress with Dragon Age 4 – it has, after all, been four and a half years since Dragon Age: Inquisition came out, and DA4 still languishes in early development. All we’ve seen regarding the next game is a very brief trailer which popped up last year, along with news that the title is likely to be a good couple of years away from fruition (at least). Kotaku’s digging unearthed what many will likely find a somewhat disturbing picture of Dragon Age 4, in that apparently the original concept for the game has been abandoned in favor of a more monetization-centric Anthem approach. According to the article, the RPG is being built on Anthem’s codebase and tools, adopting a “live service component, built for long-term gameplay and revenue”. In other words, it’s more games-as-a-service, although not with a subscription, but rather with a steady drip of additional content and micro-transactions. That sounds very different to the previous vision the development team was reportedly working with, which saw Dragon Age 4 as a smaller game than the previous Inquisition outing, allowing it to focus more on being ‘hugely reactive’ to your actions, with there being choices and consequences aplenty. The overarching idea was to implement branching quests rather than simple fetch this or kill that affairs, and to have a game which was sophisticated and varied enough in terms of its branching to be played repeatedly. So the shift to the new scheme of things will naturally sound disappointing to many RPG fans, but we shouldn’t abandon all hope at this juncture. As mentioned, the game is still relatively early in development, so this vision could easily change, and some Bioware folks have already defended (some time ago) the fact that it will be a ‘live service’ game, or rather clarified what that will mean – see General Manager Casey Hudson’s tweet below. It seems many of the devs also insist that this isn’t simply going to be ‘Anthem with dragons’. Kotaku also observes that it’s likely to be an online game, naturally, although Dragon Age 4 may actually be delivered in the form of a single player experience, alongside a multiplayer facet, the latter of which would get the post-launch content and monetization attention. That would be far more palatable to many. All this is completely up in the air, of course, and the title is still evolving constantly, by all accounts – and indeed the report even specifically notes that the game could change based on the “negative reception to Anthem”. The current storm online regarding Kotaku’s piece may well, then, be contributing to the direction which the next instalment of Dragon Age takes. We hope it ends up being something more like the original vision described above, that’s for sure.